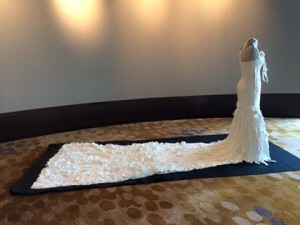 Commissioned by Beacon Converters and made from medical grade plastic Tyvec film, this piece was created to bring attention to the recyclability of this material in the medical industry. 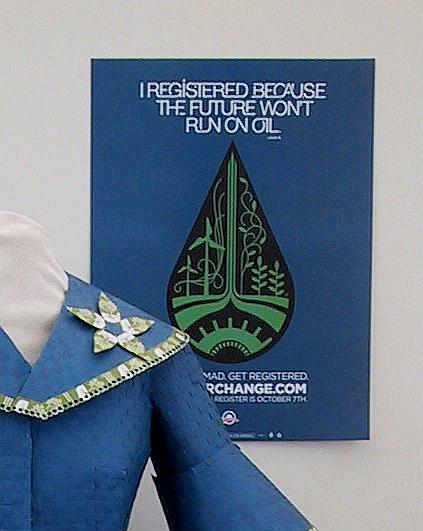 The sculpture traveled to half a dozen medical conferences around the US, where participants created flowers that were added to a second panel on the train of the dress. Learn more about Bella here. Commissioned by the Nature Conservancy of Oregon to celebrate the 50 year anniversary of Cascade Head a Nature Conservancy Preserve on the Oregon Coast. 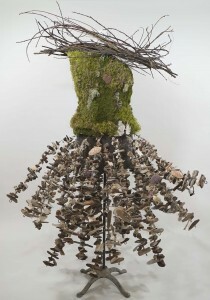 It is made primarily of natural objects: shells, wood, rocks, bones and feathers are strung on wire and connected to an upcycled steel skirt; the living bodice is made from moss, branches and pine cones sewn to burlap with reclaimed fishing wire. 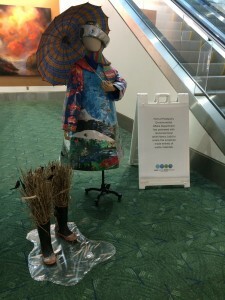 Commissioned by the Port of Portland, which runs the Portland International Airport, to showcase their extensive sustainability programs. Each of the five parts of this rain-gear ensemble represent a different program that addresses: waste, water, air, energy and natural resources. Learn more about PDX WEATHER ADVISORY here. 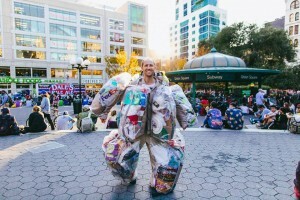 Rob Greenfield (an adventurer, environmental activist, humanitarian, and “dude making a difference”) commissioned me to create a suit that could hold all the garbage he made in a month! 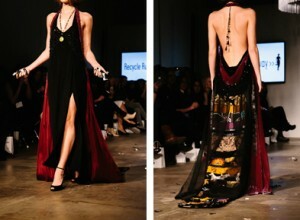 Read more about Rob and this amazing project here. I created a collection/performance piece for ECO FASHION WEEK that consists of three garments which explore the environmental and social cost of the clothing we wear. Read more about this project in the first blog post in a series that I will post this January. All of these sculptures have one striking thing in common, they were all co-created with other people which added great depth to their process and final outcome. Collaborative projects such as these have become my favorite way to work and I am so thankful to all the sponsors that worked closely with me to design these new sculptures and all the people who helped me to fabricate them! All seven pieces will become part of my upcoming solo exhibition in the Atlanta International Airport in 2018. Additionally in 2016 I started working with two very dynamic programs in Portland, Oregon (where I live) called the Right Brain Initiative and Young Audiences. Both of these programs work with the John F. Kennedy Center for the Performing Arts in Washington, D.C to bring arts integration into classrooms across the country. I was honored to be accepted into their programs and have received remarkable in-depth training from each. I’m excited to start this year with two new teaching-artists-residencies in Portland area schools, and will write a post about them that also explains and gives examples of arts integration. This work is really deepening my educational offerings, and I’m looking forward to bringing these tools into all my projects! There are also several other new potential projects germinating this winter that I look forward to sharing with you as 2017 unfolds. As we head into a new period of environmental and social uncertainty, I believe strongly that art, positive action and hope are essential. I am more dedicated than ever to this work that I am privileged to do, thank you again for all your encouragement. And PLEASE keep inspiring me with your important contributions to the world as well, together we are strong and powerful!